Get The Backyard Chicken Records Kit Only $5.99! Geese can be difficult to incubate and hatch compared to chickens and ducks. Ideally the incubating is left to a hen, duck, goose, or other broody bird, but luck doesn’t always provide a broody when you need one. Goslings make up for their difficult hatching by being incredibly easy to raise. Goose eggs should be collected daily for incubating in an incubator. Use a pencil to label the eggs with the date and mark one side with an X and the other with an O. You can collect eggs and store them at room temperature for up to 10 days. If you need to collect eggs for a longer period of time the eggs are best stored in a fridge until you need to hatch them. 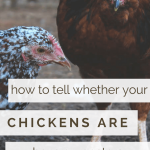 You will have poorer hatching rates from refrigerated eggs, but better than if they were stored at room temperature for a longer period of time. Eggs should be turned a minimum of 3 times daily before you set them in an incubator or under a broody. Simply turn the eggs so either the X or O is showing, whichever was previously facing down. Goose eggs should be stored laying flat and not upright in a carton. When you’re ready to start incubating the eggs you can place them under a broody or into your incubator. The eggs need to kept on their sides during incubation and should never be placed upright in an incubator. I use this (relatively) cheap and easy to clean incubator for hatching. My preferred incubator for the actual incubation process is a trusty old Brinsea Octagon 20, which can fit up to 9 goose eggs. Goose eggs need to be incubated at 99.5F for the duration of incubating. After lock down you should lower the temp to 98-99F to increase the oxygen levels for the goslings. Once they have internally pipped they will start using their lungs to breath air. The humidity levels you need will vary greatly depending on your local and household climate. It’s best to track air cell size by tracing the outline of the air cell at your weekly candling OR you can weigh the egg to make sure it is losing weight properly. You’ll be looking for an overall weight loss of 16%. For my own hatching I need to run the incubator around 30% humidity for the first 26 days and then increase to about 60% for lock down. Learn how to tell the gender of your geese with this handy post. Starting at day 8, waterfowl eggs benefit from a daily cooling and misting. Take the eggs out of the incubator, mist lightly with cool water, and then allow the eggs to cool for 10 minutes. Place back in the warm incubator after the 10 minutes has elapsed. On days 15 – 21, eggs should be cooled for 15 minutes. From days 22-25, the eggs should be cooled for 20 minutes. The cooling and misting process mimics when the mother goose gets off the nest and returns wet from a swim. 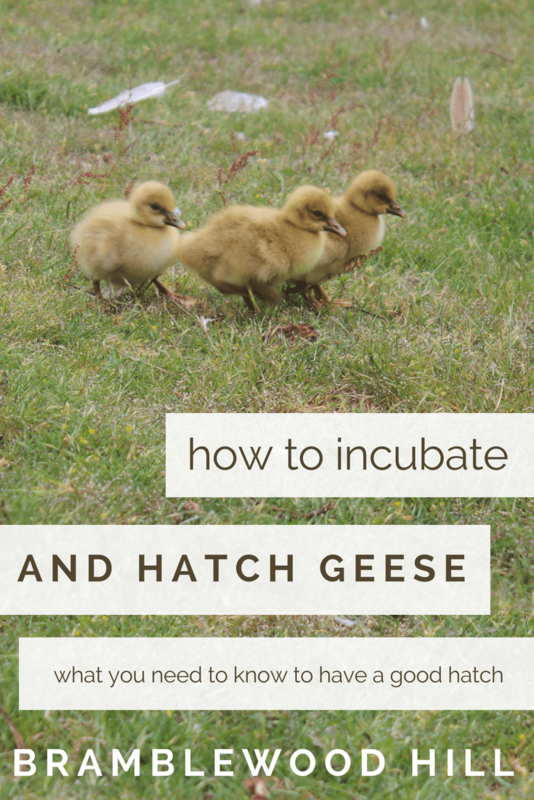 Geese need to incubate for anywhere between 28 to 35 days. I know, that’s quite a range! Almost all of my goslings end up hatching on day 32, but sometimes I have some hatch earlier or later. You’ll need to place your eggs into lock down on day 26. This is where you increase humidity and stop messing with the eggs until they’ve hatched. At this point opening the incubator can cause dangerous humidity drops that can result in your babies being shrink-wrapped (membrane dries on them and they can’t move to hatch). Moving the eggs during this time can result in the goslings failing to get in the proper position to hatch. Basically just don’t touch the eggs! Yay! You hear little peeps coming from the incubator and notice one or more of the eggs have a tiny crack (external pip) in the shell. You might be tempted to open the incubator at this point and pick at the eggs to “help” them hatch. Don’t! Once goslings have made an external pip they rest and absorb the yolk into their abdomen. During this time the blood-filled membrane surrounding them starts shunting the blood back into the gosling. Picking at the shell to “help” during this time can be fatal to your gosling! Tearing that membrane, even by accident, will result in blood less that can easily kill your gosling. “Helping” the gosling to hatch too soon (after it’s blood supply has reabsorbed) can result in it coming out of the egg before absorbing all of it’s yolk sac – which, you guessed it, will kill it. Don’t touch the eggs! Once the gosling has reabsorbed the blood from the membrane and the yolk into it’s abdomen it’s ready to hatch. It will start zipping next, which is where it starts chipping the egg in a roughly horizontal line across the circumference of the egg. They usually take lots of breaks during this time so don’t panic if they stop for a bit. After the gosling zips the egg it will push the shell apart and hatch. It will be wet, wobbly, and sort of weak. Just leave it alone to dry and rest in the warm incubator. Usually by 24 hours old hatchlings are completely fluffed up and moving around easily. At this point you should move them to a brooder if all of the eggs have hatched. If you still have eggs in the process of hatching, go ahead and leave everyone in the incubator for a little longer. The absorbed yolk sac will feed the goslings for up to 3 days. Sexing Chickens: Hen or Rooster?